explore.vision is an interactive browser-based tool for teaching the fundamentals of image processing and computer vision. It was developed by Dr Jonathon Hare from Electronics and Computer Science at the University of Southampton. explore.vision works in a modern web-browser. If you want to use a webcam to provide the video, you'll need to be using a browser that supports getUserMedia. At the time of writing, this restricts you to relatively recent versions of Chrome and Firefox. Other browsers, like Safari, will revert to playing the video from a file. Currently, you'll need a screen with a resolution above 1440x900 for the interface to display properly. The interface looks best when full-screen mode is enabled in the browser. The interface is fairly self explanatory, and is broken into four functional areas. In the top-left, the input video is displayed (either from a webcam or the built-in file). In the top-right, the processed video is displayed. 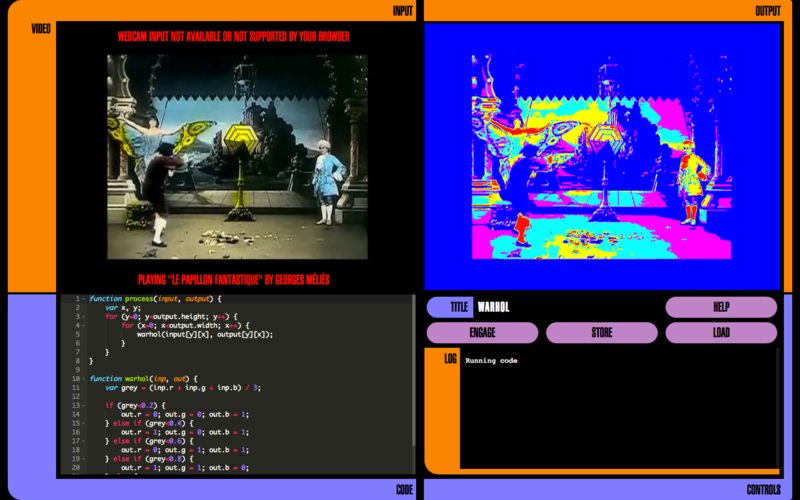 The code that performs the processing of each frame is shown in an editor at the bottom left. The controls and log output are shown in the bottom right. When you've written some code in the editor, you press the ENABLE button to start it running. The save button will save your code to the server, using an automatically generated 5-character code as a the file identifier. The load button allows you to load a previously saved piece of code. The entry point to creating processing operations is a function called process that has two parameters: the input image, and the output image. The input and output image objects take the form of augmented 2D arrays (arrays of arrays) of pixels, with additional properties for easily determining the height and width of the image. Each pixel within the images is an object with r, g and b properties to represent the red, green and blue colour values. Each colour value is a number, which should normally be between 0.0 and 1.0. The application will clip values outside of this range when drawing the images to the screen. newImage(width, height) creates a new image object with the specified dimensions. log(...) prints out information to the logging panel on the right-hand side of the interface. Logging is expensive, so care should be taken not to call it too often. A list of example computer vision and image processing functions implemented using explore.vision can be found in the filelist. The demo mode automatically cycles through the examples. The sourcecode for the explore.vision website is available from github under Version 2 of the Apache Software License (ASL). If you find any bugs, or run into problems, please report them in the issue tracker.